In the summer of 1993, Argentinean-born pianist Mirian Conti performed a concert of Paul Bowles' music in Tangier, Morocco, held at the Salle Samuel Beckett. Paul Bowles was present for this rare recital of his music in Tangier and was honored by the presence of Princess Lalla Fatima Zohra. After the concert several of Bowles' close friends were invited to the Palais Royal de Tanger in R'milat, where the pianist also performed several short piano works. Other photographs on this page include film director Owsley Brown III, whose documentary film Night Waltz: the Music of Paul Bowles would later receive several awards; duo-pianists Arthur Gold and Robert Fizdale, composer David Diamond; and Paul Bowles with Maâlem Abdelmajid Domnati, leader of the Gnawa Express musicians in Tangier. 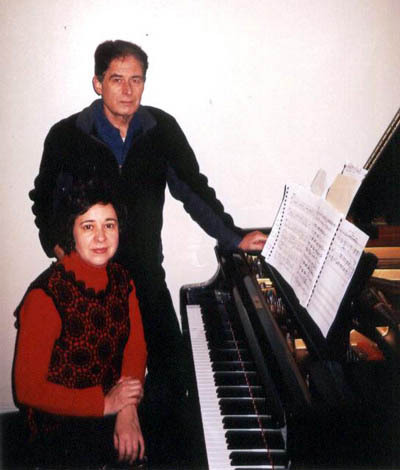 Pianist Mirian Conti and composer Phillip Ramey at the final recording session, October 31, 2007, in New York City, for the British label Toccata Classics' second CD of Ramey's piano music. 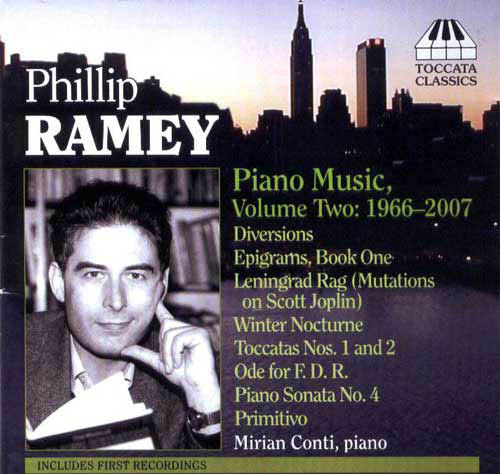 The cover of Toccata Classics CD of Phillip Ramey: Piano Music, Volume Two: 1966-2007, released in May 2008. (TOCC 0077). Ramey's Fourth Sonata is dedicated to Paul Bowles, who was in the audience at the Salle Beckett in Tangier, Morocco, on June 25, 1993, when Mirian Conti gave the work its world premiere. Aaron Copland with fellow composer David Diamond in Peekskill, New York, 1985. Visit the official David Diamond Web site: www.daviddiamond.org.